Adlai Stevenson's running mate in 1952 was John J. Sparkman, and in 1956 it was Estes Kefauver. The "I Like Ike Even Better" button was used in Ike's 1956 re-election campaign. The "I Like Stevenson" button was drawn by the famous World War II cartoonist, Bill Mauldin, while the Stevenson button with the large red A, D, and A letters was issued by Americans for Democratic Action. The depiction of Harry Truman with his lip buttoned is actually from the 1952 Adlai Stevenson campaign. Truman threw his full support behind Stevenson and actually conducted a non-stop whistle-stop campaign effort in his behalf. Stevenson, however, wanted to distance himself from Truman and his policies in the belief it would only hurt his chances to be elected. The button simply infers that the Democratic candidate, Stevenson, would be better off if Truman would simply keep his "lip buttoned" during the campaign. Eisenhower's vice-presidential running mate in both elections was Richard M. Nixon. In 1956 there was an effort to unanimously endorse Nixon as Ike's running mate at the Republican convention. This was opposed by some of the Republicans who nominated a fictitious candidate with the name, "Joe Smith." 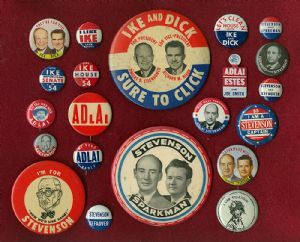 During the campaign several Stevenson buttons and tabs referenced Joe Smith, as seen here on the Adlai/Estes tab, as a direct insult to Nixon. Campaign paraphernalia, United States, History; Presidents, United States, Election, History.